You can change the spacing between characters of text for selected text or for particular characters. In addition, you can stretch or compress an entire paragraph to make it fit and look the way that you want it to. Selecting Expanded or Condensed alters the spacing between all selected letters by the same amount. Kerning alters the spacing between particular pairs of letters - in some cases reducing and in other cases expanding the space depending upon the letters. On the Home tab, click the Font Dialog Box Launcher, and then click the Advanced tab. 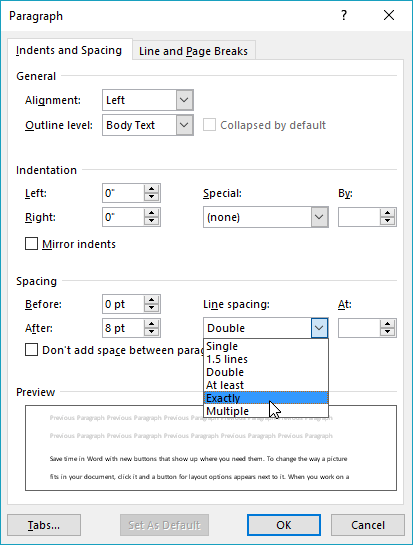 Note: If you're using Word 2007 the tab is called Character Spacing. In the Spacing box, click Expanded or Condensed, and then specify how much space you want in the By box. Kerning refers to the way spacing between two specific characters is adjusted. The idea is to give a better looking result by reducing the spacing between characters that fit together nicely (such as "A" and "V") and increasing the spacing between characters that don't. Select the Kerning for fonts check box, and then enter the point size in the Points and above box. When you scale the text, you change the shapes of the characters by percentages. You can scale text by stretching it or by compressing it. Select the text that you want to stretch or compress. In the Scale box, enter the percentage that you want. Percentages above 100 percent stretch the text. Percentages below 100 percent compress the text. To increase or decrease the amount of vertical space between lines of text within a paragraph, the best method is to modify the style the paragraph uses. Find the style you're using in the Styles gallery on the Home tab. Right-click the style you want to change and select Modify. Near the center of the dialog box you'll find the line spacing buttons that let you select single, 1.5x or double spaced. Choose the spacing you want to apply and click OK. 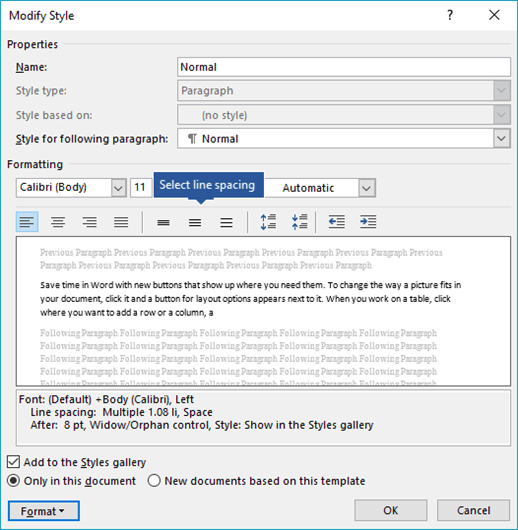 If you'd like to apply more specific line spacing to the style, clickthe Format button at the bottom left corner of the Modify Style dialog box and select Paragraph. The Line spacing drop-down lets you select or set more specific line spacing. 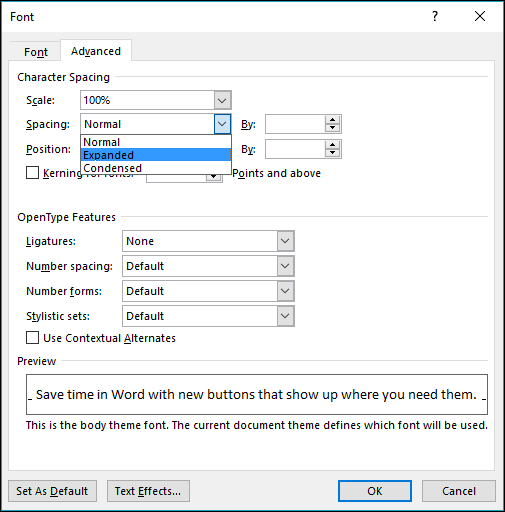 For more information on modifying styles in Word, see: Customize styles in Word. Using Styles in Word - a free, 10-minute video training course. Post a question in the Word Answers Community. 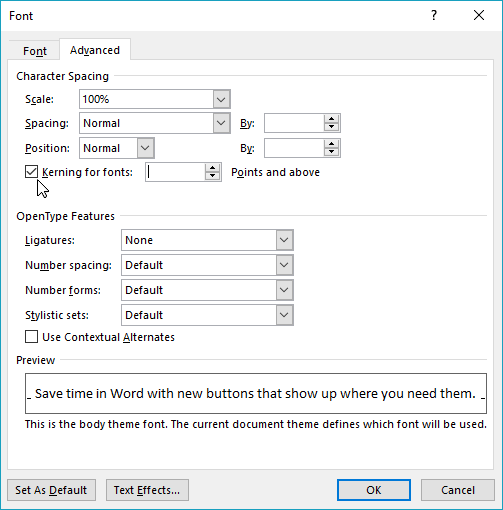 Do you have suggestions about how we can improve Word? If so, please visit Word UserVoice and let us know!